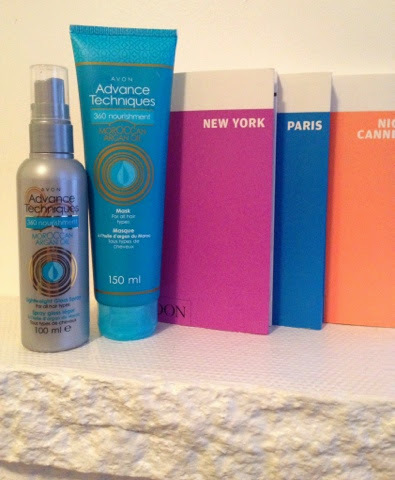 A while ago in my post The pursuit of...Strong, healthy hair I talked about a new range of hair products that I bought from Avon that contained Moroccan Argan Oil. 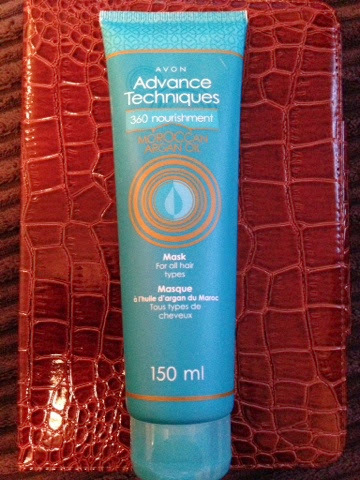 It was all from their Advance Techniques 360 nourishment range and it has done wonders for my hair. Apart from how silky, soft, strong and healthy my hair looks, it has really improved my scalp condition. I used to suffer from a really dry, flaky scalp which no matter what products I used (prescription or over-counter) would always be persistent. 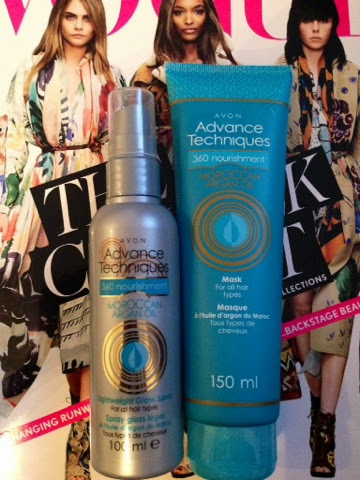 I have noticed that since I have been using this whole range (below) it has improved dramatically. So,when I saw that Avon had added a Mask and Gloss Spray to the collection, I was eager to see what it was like. Again, both products are so reasonable in price which is even more of an attraction. It is so nice to actually find hair care products that produce brilliant results without having to fork out a fortune. So...for those of us who like the polished look, this lightweight gloss spray is perfect (above). I have used gloss sprays and oil sheen sprays before in the past, as the way I often wear my hair requires a need to maintain a sleek and smooth look (perfect for those side-parting ponytails!). 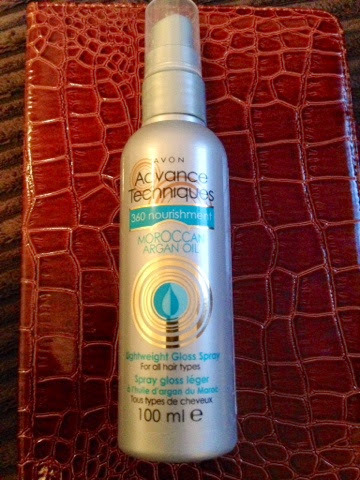 My hair has really responded well to the shampoo/conditioner and hot oil treatments from this range as mentioned already. This mask (above) is just an added bonus really and is especially beneficial during these hot summer days where your hair is exposed to extreme conditions. I have used it just the once so far and it made my hair super soft. It is also brilliant at detangling. Although it says to leave for 5 minutes, I got a more intensive treatment out of it by putting mine on during one hot summer day and then sitting in the garden for a couple of hours with a plastic cap on my head covering it!....It smells gorgeous too! These products I believe can be ordered online or via your local Avon representative.